Do you remember the TNG episode where a bold, independent woman rubs Picard the wrong way, makes an enemy of Riker, forces Crusher to face deeply unrecognized feelings, and enchants the Captain? Or when a disaster on an isolated planet forces this woman to face the realities and dangers of what an assignment to a Galaxy Class Starship can mean, and ultimately teaches her that being at the forefront of adventure is not who she really is? I’m talking about the sixth season episode “Lessons,” featuring Nella Daren. 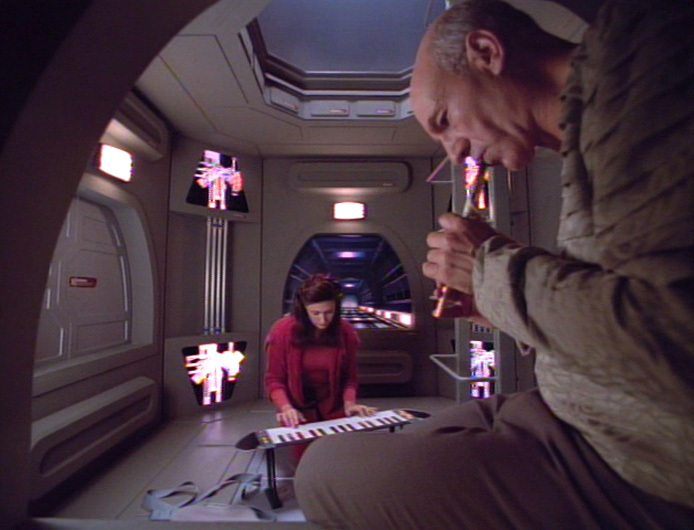 The one where Picard falls in love with “not Crusher” and we get to see Trek use music as a “subtle sexual metaphor.” By the end of the episode, Picard realizes how difficult it would be should Daren remain on the ship, but luckily she’s already decided to ask for reassignment. This episode is worth examining because while it’s a lacklustre Picard episode it’s an AMAZING episode for Daren. Her character is the one who grows and changes the most by the end, and who endures the most challenges. Where the writers only marginally succeeded in crafting a compelling Picard story, they accidentally excelled at creating a fascinating Daren story. What do I mean? Daren’s character is complicated and layered, given life by circumstances the writers provide. She’s an intelligent woman with a powerful sense of control. 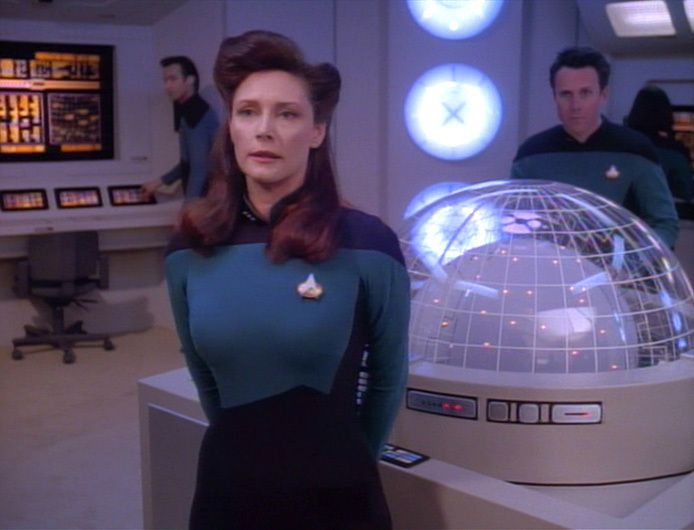 The first time we encounter this new head of Stellar Sciences she has literally shut down the entire Ent-D, Captain’s replicators included, to run an experiment at 3am. In a perfectly staged ‘meet-cute’ she then manages to talk back to the captain, feed him some disgusting tea, and yet somehow still manages to catch his eye. We know that Daren requested a transfer to the Ent-D, probably out competing a slew of other Starfleet officers for the same open Stellar Sciences position. This determination and confidence sees her approach the Captain with her interest in music when she learns of his own. It’s clear that her intellect and professional determination are attractive qualities to Picard. In the matter of a few days, Daren becomes enmeshed in the life of the Picard, a man we know is very particular about who he spends his time with. The writers have given us a perfect romantic companion for Picard. 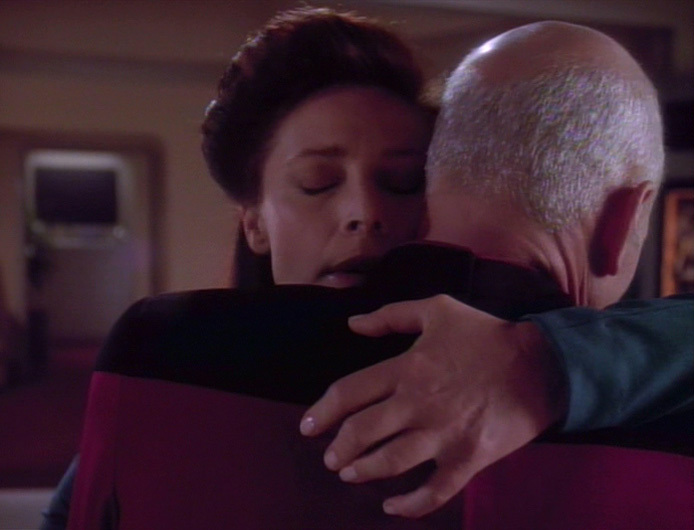 Vash was lovely, but more of a romantic foil, while Daren is the perfect compliment to Picard’s nature. Daren as a character isn’t designed as the ‘perfect woman’ for Picard. Instead she’s built as a capable and dedicated professional whose traits pair well with the Captain’s. She isn’t a romantic pandering, she’s a real person. A real person with her own flaws, flaws that complicate her relationship with Picard but aren’t directly linked to him, they are instead elements of her OWN character, not designed as reflections of the male lead. Her desire for control leads her to break protocol when it comes to crew assignments and resource requests, so much so it leads Riker to tell Picard he’s “uncomfortable” with Daren’s insistent and persistent nature, concerned Daren may be leveraging her relationship with the Captain. The audience knows this is not the case though, Daren is portrayed as dedicatedly persistent, not opportunistic. Riker’s reaction to her speaks to the modern day notions around authority and romantic relationships, rather than what we are led to believe is standard practice in Starfleet. Picard goes as far to say that Starfleet has no regulations regarding fraternization among its crew, a truly enlightened environment considering the current climate regarding sexual assault in the contemporary militaries. Daren’s capability and expertise sees her assigned to a dangerous mission. Daren, who we have seen in complete control of her surroundings until now is left at the mercy of fate. Picard holds the power, and he makes the very correct (and tragic) decision to sacrifice her for the sake of the mission. 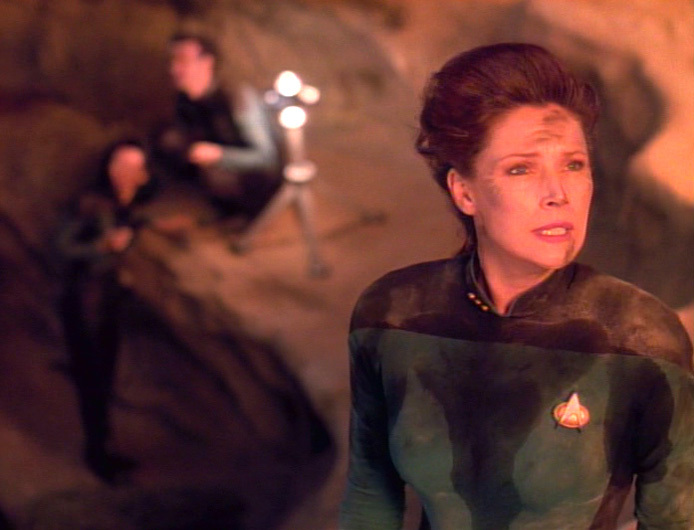 Daren doesn’t fault or blame Picard for this, but accepts her duty and the truth about why she is on Bersallis III, to protect the lives of others. A character who has been built up this whole time now faces their biggest test. After her miraculous rescue, Daren recounts her experience on the planet. What the writers tip-toe around is the fact that Daren was forced to watch several crew under her command literally burn to death before her eyes while she was powerless to help. For someone who’s life is about control, this is a shattering experience. When Daren decides she’s leaving the Enterprise, it’s not out of deference to Picard’s anxiety. The experience on the planet has demonstrated that the danger a deep space assignment poses is very real, and very affecting. Her sense of control has been destroyed, and she is left wondering who she is; a scientist yes, but perhaps not an explorer. Her request for reassignment is a professional recognition of her limits and skills, a mature assessment of who she is and what she wants; A desire to never again be put in the same position she was on Bersallis III. Picard is a big part of this episode too, however its impact on him is severely dampened by a much better episode earlier in the same season, “The Inner Light”. After Picard has literally lived the adult life of another married man in the space of a single episode, any ‘romantic’ revelations he may have are deeply overshadowed by that experience. The short-lived romance of a Captain and his officer hardly compares to the lifetime of companionship he lived. It’s not to say that Picard will never again have a deep romantic relationship, but it does weaken the relevance of any relationships that were never meant to last. “Lessons” is an okay Picard episode, but a GREAT Daren episode. It takes her character further in 45 min than most of the regular cast in an entire season. It’s a shame her story is played as supporting, rather than being brought to the forefront. Excellent analysis of this great episode. I remember being irritated, not at Daren, but at Picard, for his attitude at the end of the show. I was also irritated that Daren chose to leave the ship, but only because we wouldn’t see this compelling character again. One tiny correction: “The Inner Light” was a late season 5 episode, while “Lessons” was mid-season 6. They’re not in the same season.